Here it is — an exhibition of paintings for the masculine sensibility. 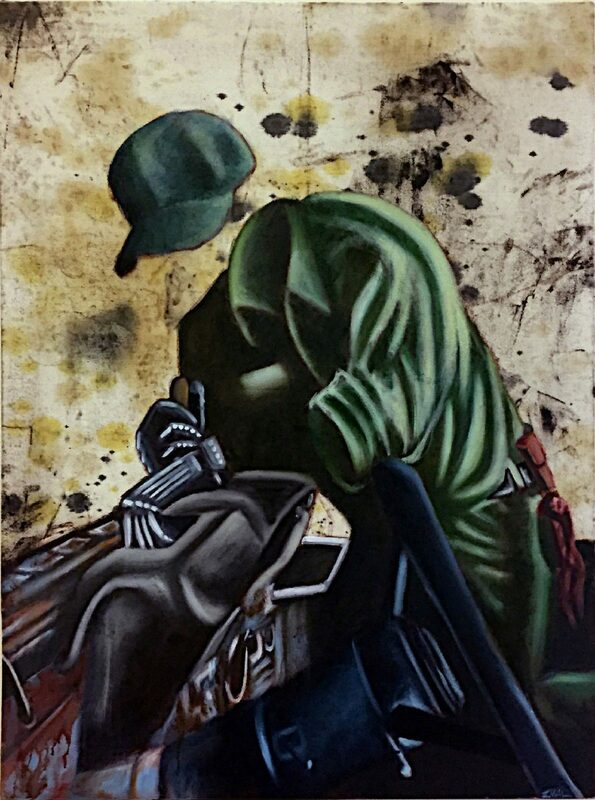 Corpus Christi artists Jason Valdez and Jonathon Garza present a series of paintings that evoke the ethos of the blue-collar worker. “Busted Knuckles” is now on display at the McAllen Public Library. The exhibition layout separates the artists’ works, with Valdez’ large paintings of automotive motors on one side of the gallery, while Garza’s small images of protective gear flanks the opposite wall. "Radioactive lV" by Jonathon Garza. 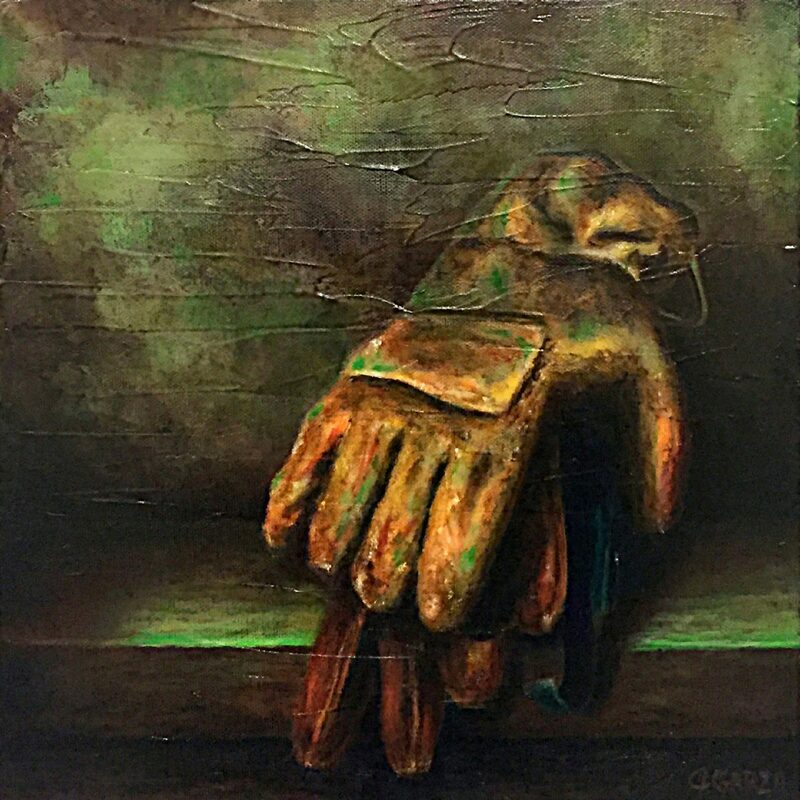 "Still Life of Leather Gloves (His and Hers)" by Jonathon Garza. To Valdez, the tools and materials used in the trades and the fine arts are not that different. He uses power tools and carpentry skills in creating his pieces, along with used motor oil, grease, and the recognizable red shop rag. 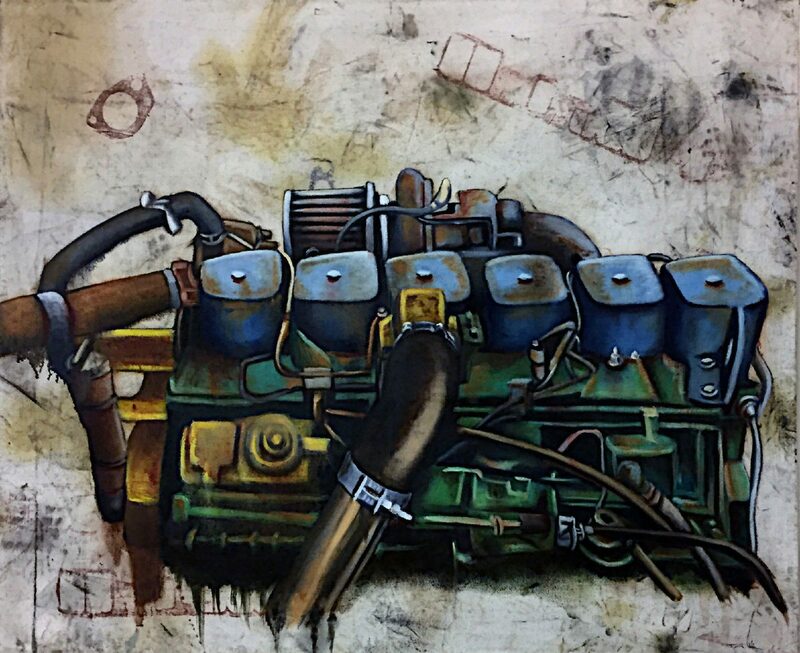 “I am fascinated by the blue-collar work ethic and I use the motor as a symbol of this spirit,” he said. Garza, however, gives the viewer a cautionary tale with his subjects, using objects he works with and loves as negative symbols. Chemical masks, goggles and gloves are meant to represent the pernicious eventualities on the ecosystem if we don’t protect it; they represent toxicity. He recognizes our current epoch as a time when the ecosystem is primarily shaped by the effects of human activity, and he wants us to be aware of our unsustainable direction, where protective gear will become necessary for daily life. Their realistic styles fully engage the viewer. Valdez’s smoothly detailed paintings could be illustrations were it not for the beauty and orchestration in his tonal treatments. His abstract backgrounds lend a lilting musicality contrasting with and embracing his subjects simultaneously. These works are statements of industrialization and the objects chosen by both artists may already represent a bygone era; computers are moving us into a new and different industrial age, although the ecosystem warning is still valid. In viewing these works, we can already feel a nostalgia for the objects that Valdez and Garza have painted and the essentially male dominated activities they characterize. Both artists isolate their subjects. Valadez’s compositionally centered motors feel like icons. 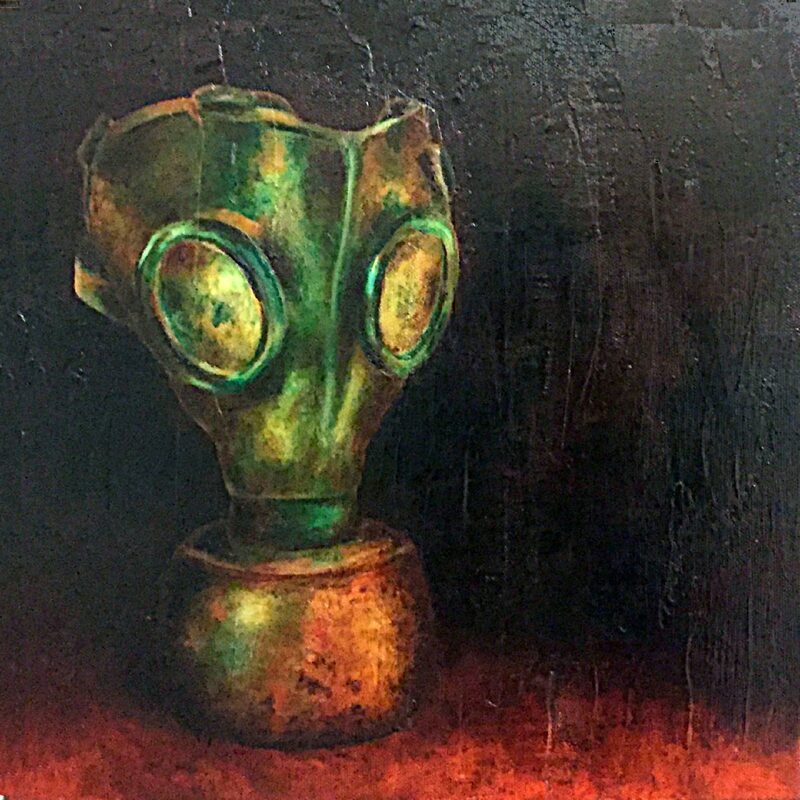 Garza’s protective gear moves from place to place in his paintings, as though desperately seeking a new purpose. 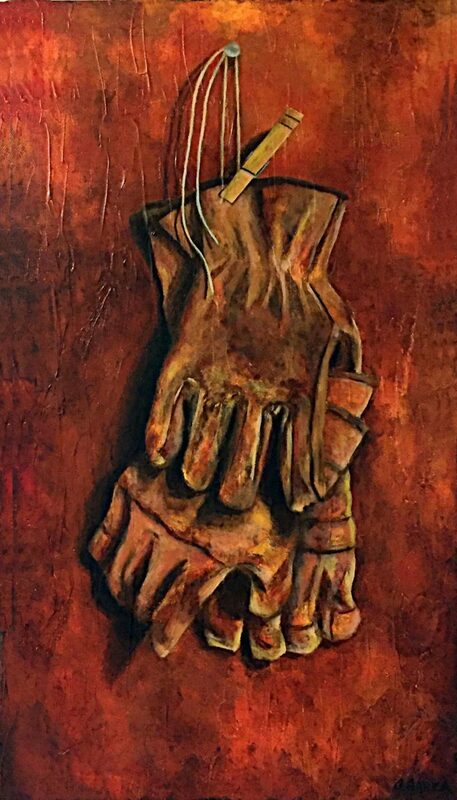 Empty gloves are sometimes given the status of familial relationships, attempting to find comfort when there is none left. Nancy Moyer, Professor Emerita of Art for the University of Texas Rio Grande Valley, an art critic for The Monitor. She may be reached at nmoyer@rgv.rr.com.